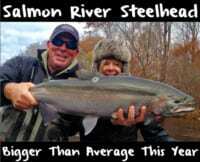 The month of January brought slow steelhead fishing to the greater Eureka area. The large rainfall totals blew our rivers out. We only got to fish two days the entire month. In fact, steelhead anglers in this area spent their time up north on the Smith and Chetco Rivers. Meanwhile, that’s normal for winter. We’ve dealt with these conditions forever. This comes with the territory and normal rainfall. However, in the last week we’ve been fishing the Eel, Lower Trinity, Mad, Van Duzen and other local rivers and things were decent, but not great. I’m betting that the meager action is a reflection of four years of drought. So far this season our returns seem below normal. In many cases I’m seeing downers already. The bright spot has been the Mad River. It’s loaded with steelhead and has been loaded for a while. The Mad River Hatchery had a ton of fish last month, too, which is a good sign. With that being said this shouldn’t be a surprise. The drought probably didn’t affect it as much as other local rivers because the fish made it in the hatchery and were spawned. Steelhead in route to the Mad River didn’t have to go into the tributaries like fish in the other nearby rivers so there was sufficient water for spawning. The South Fork of the Eel River will produce fish (when fishable) the rest of the season. By midweek I expect the South Fork to be fishable again. It’ll start to fish up near Leggett and then more water will become fishable as long as more rain doesn’t fall. The Mad and Van Duzen will come in shape a few days after the South Fork. The main stem of the Eel will definitely take longer to come in. It’s always the last of our rivers to fall into shape and clear. The Lower Trinity is still large. They’ve had good runs up higher, but we haven’t been able to fish down low because of high water. On the upper end of the system Junction and Douglas City saw good numbers of fish and if El Nino doesn’t hammer us late in the season we’ll be able to fish the Lower Trinity in a few weeks and find action. As always, the storms are going to dictate where we can fish. If we are only getting an inch out of the storms we’ll fish sooner, whereas a 3-4 inch storm will keep us off the water for a while. Only Mother Nature knows what’s in store the rest of the season. Regardless of what system I’m fishing I’m side drifting bait and pulling plugs. With bait I’m using Natural BorX O Fire on 10-pound fluorocarbon leaders and 15-pound P-Line as a mainline. When plugs are applicable we’ll use 3.5 inch Maglips in the main runs and tailouts, normally in 3-5 feet of water. Stick with those methods and you’ll have the best chance at success. Editor’s Note: Guide Alan Borges operates Alan’s Guide Service. 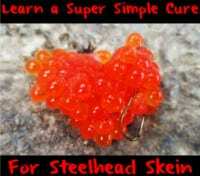 For more info on his North Coast steelhead trips please visit http://alansguideservice.com.